While most basic sewing machines can handle the occasional set of baby clothes, sewing clothing comes with its own list of complications that are unique to the craft. While quilting uses many of the same stitches and sewing clothing, the fabric weights and desired stitches can vary depending on the project. From zipper and buttons to thick weight fabrics and complicated corners, the best sewing machine for making clothes needs to have all of the basics covered, but should be versatile enough to take on even the thinnest jersey hem. If you find yourself stitching clothing on a regular basis, you want to invest in a sewing machine that can turn out your next runaway show of projects without breaking down or dropping stitches, while still feeling like you can take on other projects. That’s where investing in a good, full-sized sewing machine comes into play. A good sewing machine for making clothes will have a wide range of stitches and options, without overwhelming you. While most basic sewing machines can take on their fair share of clothing repairs, you want to look for a sewing machine that comes with a wide range of presser feet to choose from, so you don’t find yourself trying to sew on a zipper without the proper foot. You should also look for a sewing machine that is heavy-duty enough to take on the occasional heavier fabric, but not the industrial machines that you would use to take on leather projects. If you find yourself sewing large amounts of denim or leather, you should check out our pick for the Best Sewing Machine for Leather and Denim to see our picks for a truly heavy-duty sewing machine. Without further ado, here are the best sewing machines for making clothes. 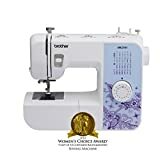 Durable, dependable, and basic, the Brother ST371HD may not win any awards for stitch choice, but it’s a great all-around sewing machine for anyone looking to sew a wide range of clothing. The heavy-duty design of this sewing machine makes it a worthwhile investment for any crafter, and the internal mechanics are specially crafted to take on high volumes of projects day in, day out without issues. This machine is made to take on bulky fabrics and troublesome corners, as pointed out by one successful crafter in their review: “I did these stocking 4 layers 2 was fleece for the stocking & the cuff was three layers one was fleece and it went through all the layers and didn’t even slow down.” While this sewing machine doesn’t have as many stitch options as you would want for more creative clothing creation, this is a good workhorse of a sewing machine for your sewing needs. This portable sewing machine comes with its own supply kit, including cleaning brushes, additional presser feet, and an easy stitch selection design that makes it a cinch to use. Although the machine has a “Bit of a learning curve with setting up the tension and using the correct needles,” according to one reviewer, the overall consensus is that this is the perfect machine for a beginner to advanced tailors and seamstresses. With an adjustable free arm for collars and sleeves, the utilitarian design of this sewing machine makes it a great option for anyone looking to experiment with different types of clothing without committing to a heavy-duty sewing machine. And with an automatic needle threader, the SINGER Tradition 2259 Portable Sewing Machine will take the headache out of your next full-scale sewing project. 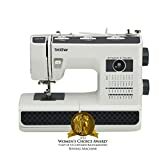 This fairly basic sewing machine is a good option for anyone looking for a nice, easy-to-use sewing machine to take on a wide range of clothing projects. 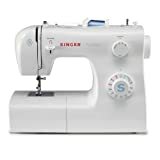 The six included sewing feet, as well as the free arm design for collars and cuffs and the instructional DVD make this sewing machine a no-brainer for beginners and experts alike. As one reviewer raves,“ I have seen a variety of lightweight to heavyweight projects with zero mechanical problems. No broken needles, no jams, no tension problems!” While this machine isn’t as fancy as some of our other options, this sewing machine is sure to get the job done with flying colors. With easy-to-follow instructions, the Brother Sewing and Quilting Machine CS6000i are sure to steal the show at your next red carpet. The durable design makes it easy to take on more difficult projects like denim, or even canvas. As one reviewer noted, “ I’ve been sewing totes and bags, which can have several layers to sew through. So far, it’s been able to handle whatever thickness I give it.” And with 60 stitches to choose from, this sewing machine is perfect for more creative sewing projects. While the LCD display may take some getting used to, the instructional DVD helps minimize the learning curve, making this a must-have for anyone looking to start sewing clothing. It’s hard to beat a sewing machine that has “stylist” in the name. While this sewing machine does come with a bit of a learning curve thanks to its computerized design, the 960 stitches, as well as built-in lettering function make this an ideal sewing machine for making and repairing clothes. As one reviewer noted, “It’s so easy to use and for the price, I received many sewing feet and the extension table and a cover. 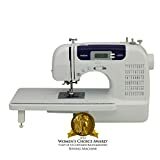 I really like the auto cut button.” While not as heavy-duty as some of the other options, this is a great machine for anyone looking to take the clothes projects to the next level. No matter the scope of your next project, the SINGER Quantum Stylist 9985 Computerized Sewing Machine is hands down the best sewing machine for making clothes.